Juventus entered this game knowing a win would take 16 points above the second-placed Napoli in the Serie A league table. The Old Lady did just to shoot down Napoli whose unbeaten streak at San Paolo over the last one year came to an end. 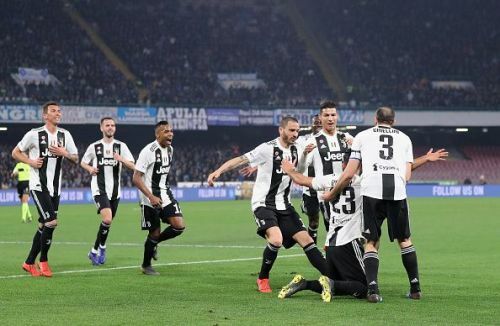 The game ended 2-1 to Juventus, but it was not a fair reflection of the game as the side from Naples kept on piling pressure on their opponents from minute one to heap past them in the offensive play. When the game looked wide open, Marco Ruiz's poor pass went straight to Cristiano Ronaldo. The Portuguese international was taken down outside the box by the young goalkeeper Alex Meret in the 25th minute and the keeper received a red card. His replacement, David Ospina, was unable to keep out a first-rate free kick from Miralem Pjanic and that handed over the lead to the visitors. Eleven minutes later, Emre Can scored from the set piece to put the game beyond the bed. For rest of the half, Juventus sat back and saw the game out to hear the half-time instructions from the manager Massimilano Allegri. Two minutes after the referee blew for the kick off of the second half, Miralem Pjanic was sent off for receiving a second yellow card while he tried to handle the ball. Napoli kept on swarming in numbers inside the opponent's penalty box and got the much-deserved goal when Jose Callejon tapped the ball from close range to cut down the deficit to one. A controversial penalty was awarded to the hosts, but the skipper Lorenzo Insigne could not make full use of it as he hit the crossbar from the spot-kick. With this defeat, Napoli's hopes of ending their title drought have come to an end unless Juventus slip up in the next few weeks. In this article, we shall look at five individual best and worst performers from the game. Polish International Piotr Zielinski was one of the best players on the pitch tonight. The Napoli midfielder caused plenty of trouble to Juventus' defence from the start of the game. 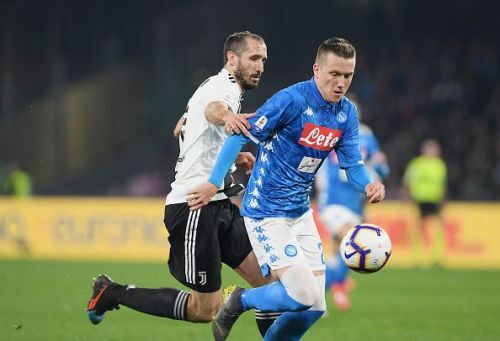 When Juventus scored at the one end, Napoli were provided with a chance to equalize the score through a counter attack, but Zielinski was not able to take it as the ball hit the post. He came to light only after Napoli received a red card in the first half. The midfielder was dancing through the right side of the defence and gave so much think for the Old Lady defenders. Carlo Ancelotti will be delighted with Zielinski's performance, but the result would not satisfy the Napoli boss. The 24-year-old has been eyed by other clubs such as Arsenal and Liverpool for a move in the summer, and it could be hard to keep hold of this talent.